As we highlight various local restaurants with a farm-to-table focus and their new fall menus we were excited to see what the new talented culinary team at The Tavern had put together for this season. 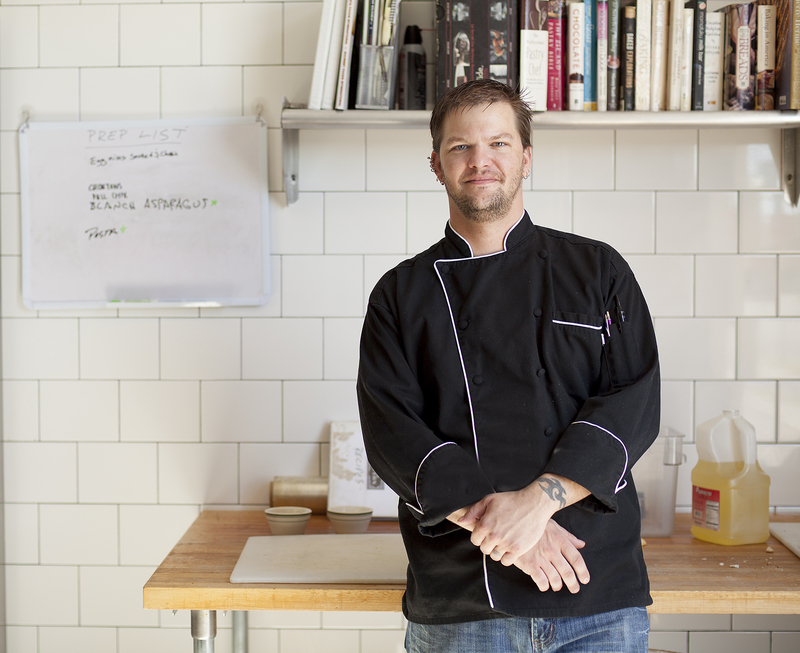 Chef De Cuisine, Matthew Bailey and Pastry Chef, David Robuck headline the talent in the kitchen. 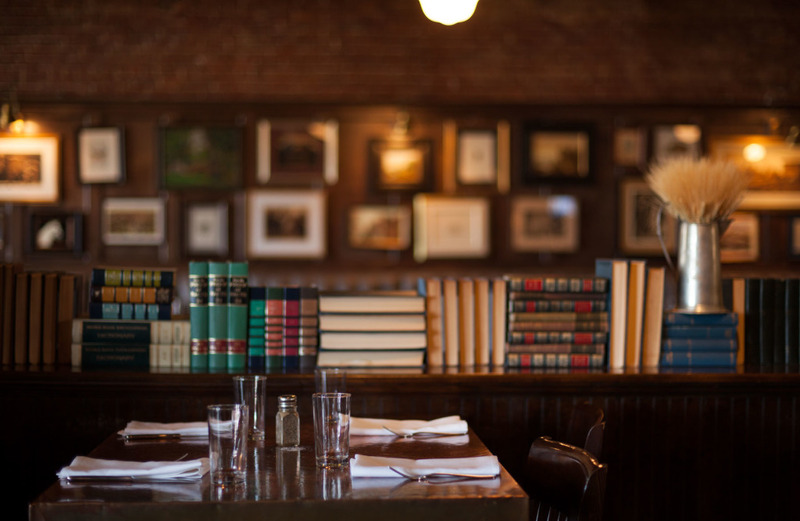 From our experience of sampling each of the their new menus (brunch, lunch, and dinner), these chefs have quite possibly put together the strongest menus in the history of The Tavern – and that is saying something. First meet the Tavern’s culinary team, then salivate over some of the new fall dishes on each menu. 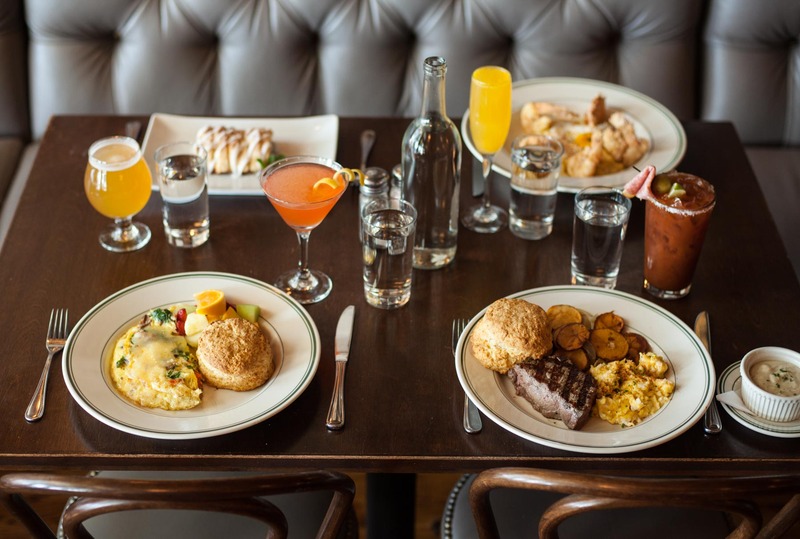 On this particular Sunday we ordered 4 dishes off the brunch menu: the Shrimp & Grits, the Daily Omelette, the Western Breakfast (Steak and Eggs), and the Chef’s Choice Fresh Pastry. 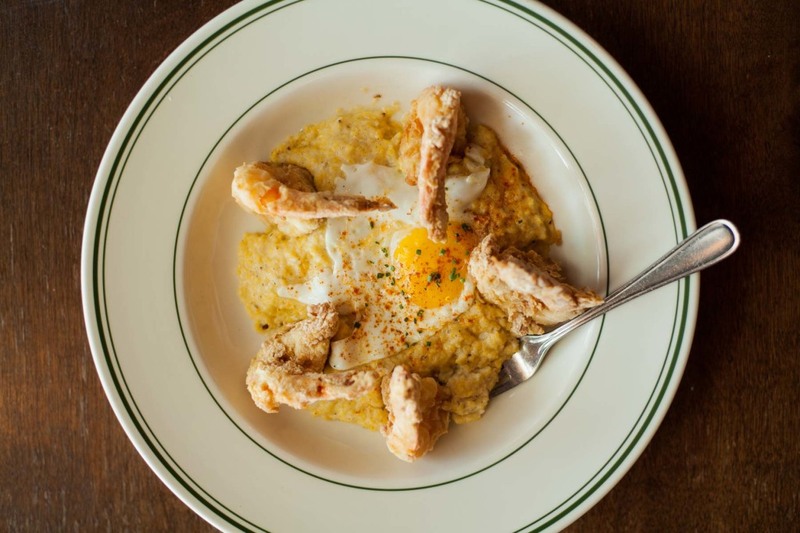 The Shrimp & Grits ($15) is composed of 5 jumbo fried shrimp that surround a sunny side up egg sitting on the rich (and filling) creamy grits. A sprinkling of finely chopped chives garnishes the egg and livens up the color of the dish. The Tavern takes this southern classic and gives it the simple addition of the egg that has turned this into many Tulsans’ favorite brunch comfort dish. The Daily Omelette ($10) changes each brunch based upon seasonally available ingredients and Chef Matthew’s inspiration. 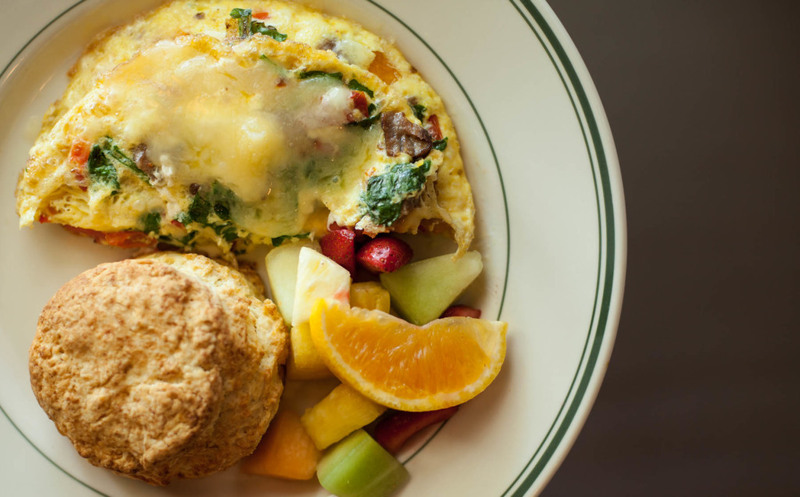 Ours was packed full of fresh greens, tomatoes, peppers, and sausage – all melted into a generous blend of cheeses in and on the golden fried eggs. The dish is served with your choice of biscuit or toast and your choice of grits, brunch potatoes, or fresh fruit. We ordered a side of fruit for some natural sweetness to accompany the savory flavors of this hearty omelette. 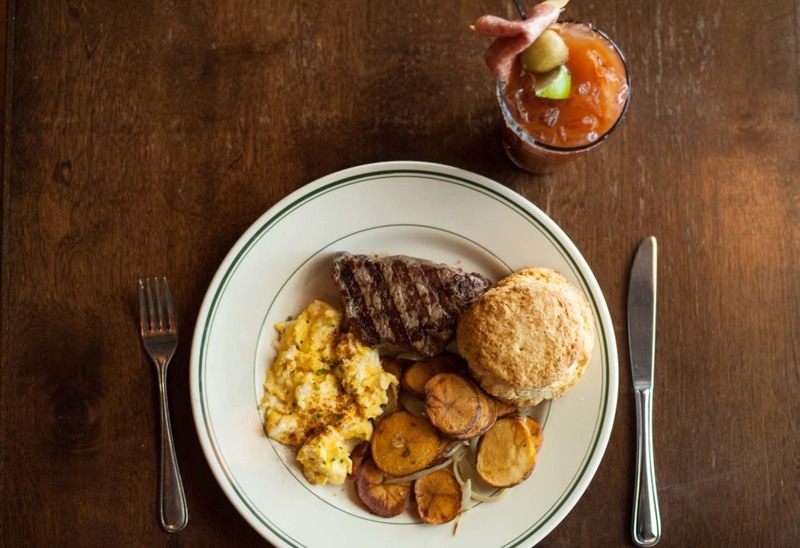 The Western Breakfast ($18) is the Tavern’s steak and eggs. The New York Strip comes with the brunch fried potatoes and freshly baked biscuit. We ordered the steak medium rare, the eggs scrambled, and a side of Bloody Mary. The strip had warm red center and was marbled and juicy as expected. I must say that for under $20 the cut and quantity of this beef exceeded my expectations. 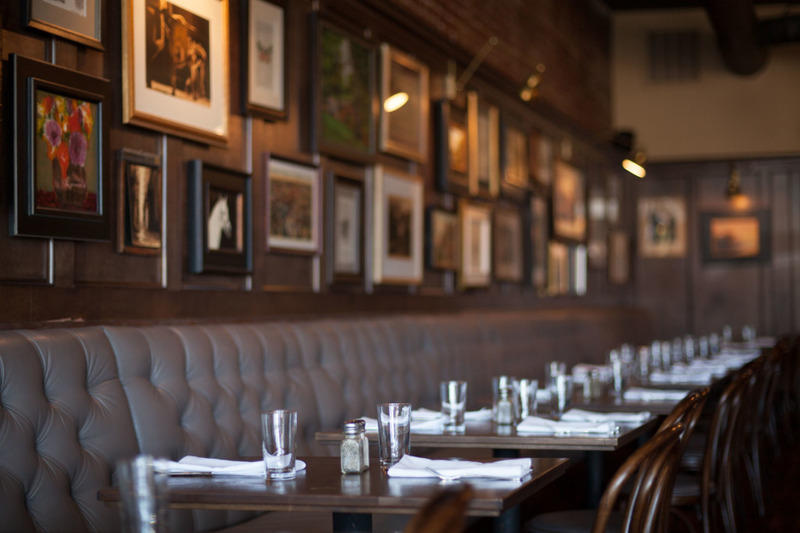 There are some very good steak and eggs options in Tulsa – both in quality and price point. This one is very hard to beat, and is among the best for certain. The Bloody Mary ($7) is such an excellent pairing for this dish as it continually reminds you of how fortunate you are to be eating a quality NY Strip – for breakfast. It’s a thick house made blend mixed with pepper infused Tito’s vodka that will put you in the proper state of mind. 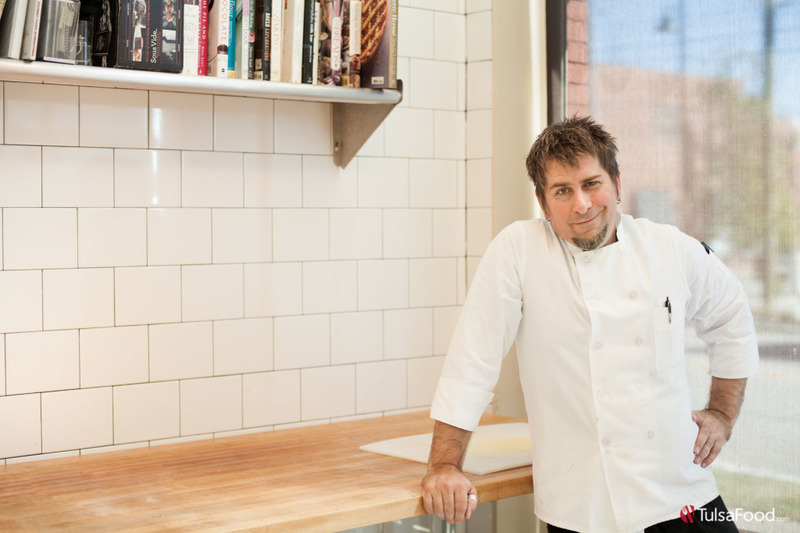 The Chef’s Choice Fresh Pastry is a creation that changes weekly developed by Chef David Robuck. 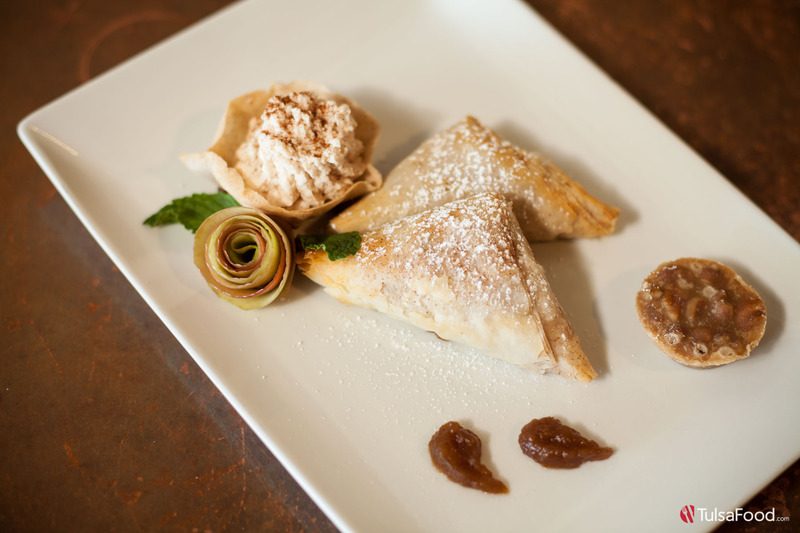 In our case a sweet combination of apple and cranberry filled the pastry drizzled with icing that was quickly devoured. 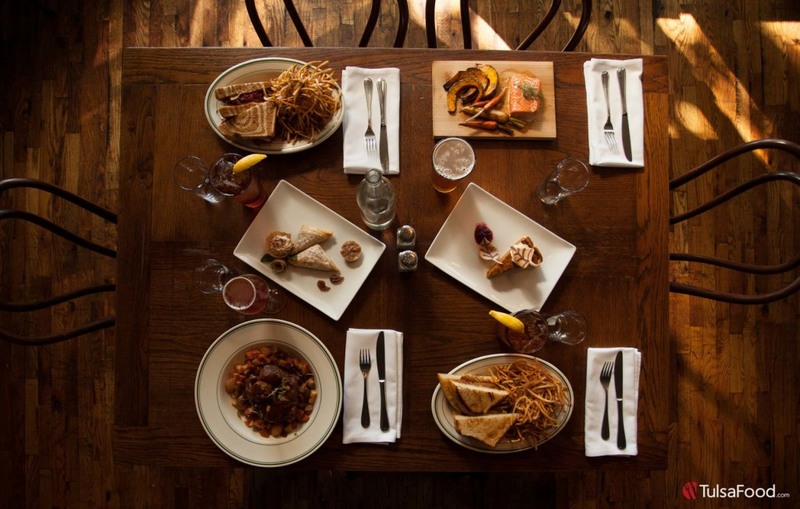 Whether you are settling into a long business lunch or you need to be in out in 45 minutes our experience with The Tavern is that they are always able to accommodate both with generous portions, timely service, and satisfying flavors. The addition of these two new sandwiches on the fall menu is no exception. 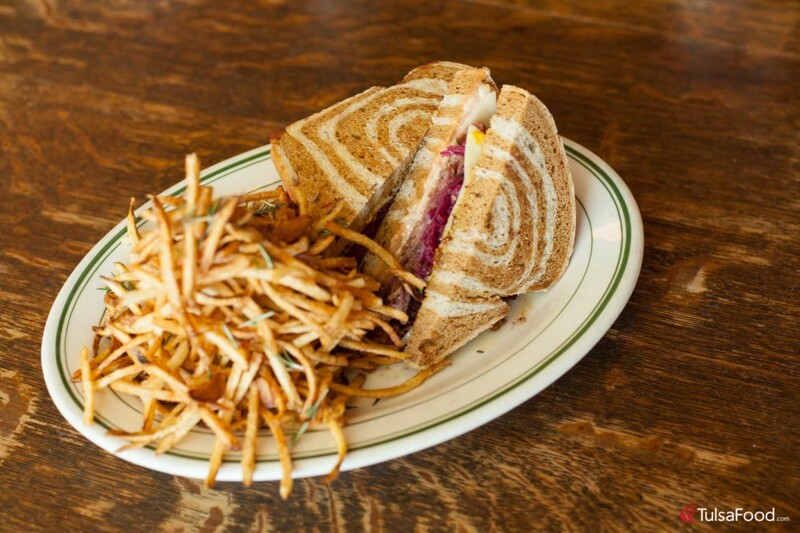 We want to bring attention to both the Grilled Meatloaf Sandwich, and the Reuben. These are both very very good, but the Grilled Meatloaf Sandwich ($12) has already become a TulsaFood staff favorite. 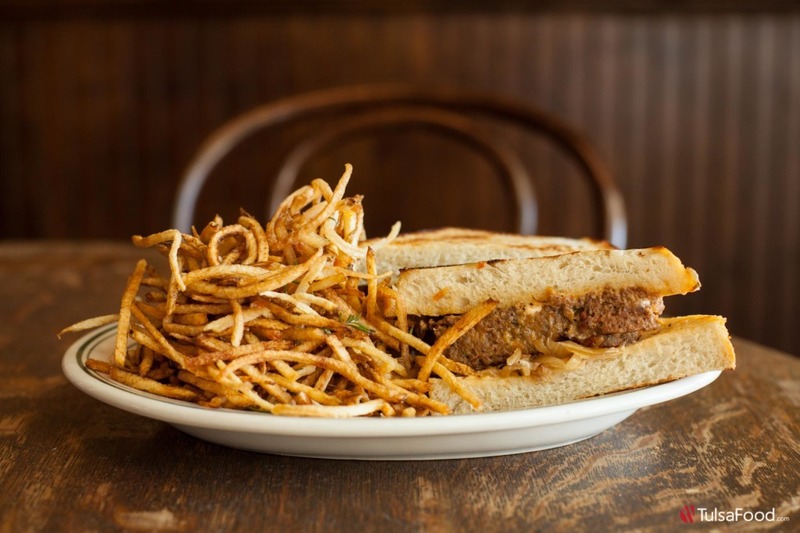 First, the shoestring rosemary frites sit piled high, hot, and delicious next to this mountain of a sandwich. Like the Tavern Burger, the beef for this meatloaf is ground in house. Then it is formed and combined with various cheeses and finished on the grill. The thick meatloaf sits on a potato bread bun that has been spread with a spicy house mayo. It’s absolutely delicious. For many in Tulsa whether or not a restaurant can offer a solid Reuben at lunch makes the difference of whether or not that restaurant will be in on the lunch rotation. Chef Matthew has stepped up and made certain this classic sandwich at The Tavern will appeal to even the most critical lover of a Reuben ($12). 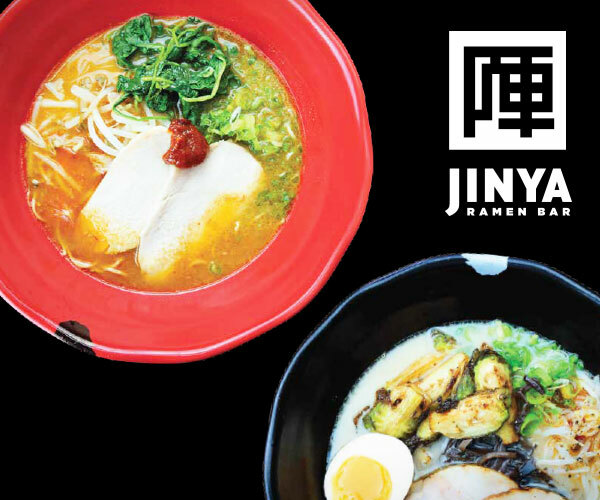 Again, it seems impossible to leave hungry after ordering this dish. But it’s not the portions that make this sandwich a must try if you a Reuben fan. 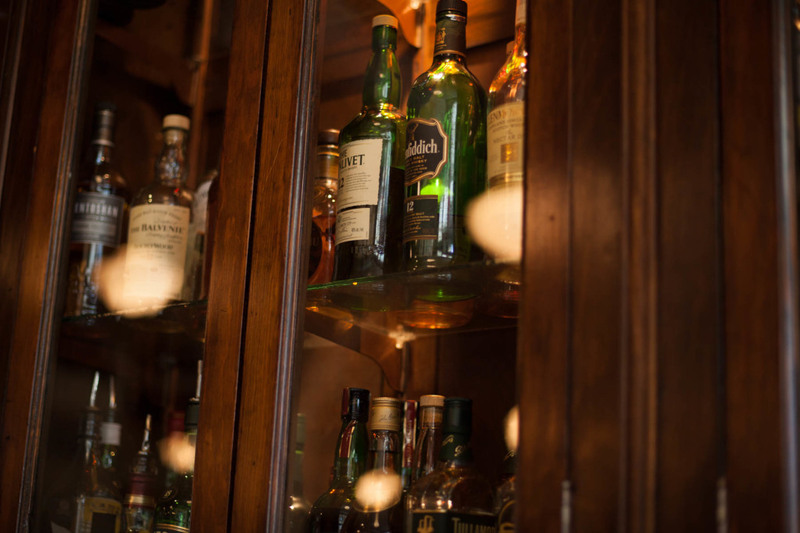 It’s the balanced blend of all the classic elements in this gastropub context. The corned beef is cured and made in house, the red kraut is layered in perfect proportion next to the beef, the mustard is made with Guinness, the marbled rye is spread with a thousand island sauce, and the Swiss cheese melts perfectly into to beef. 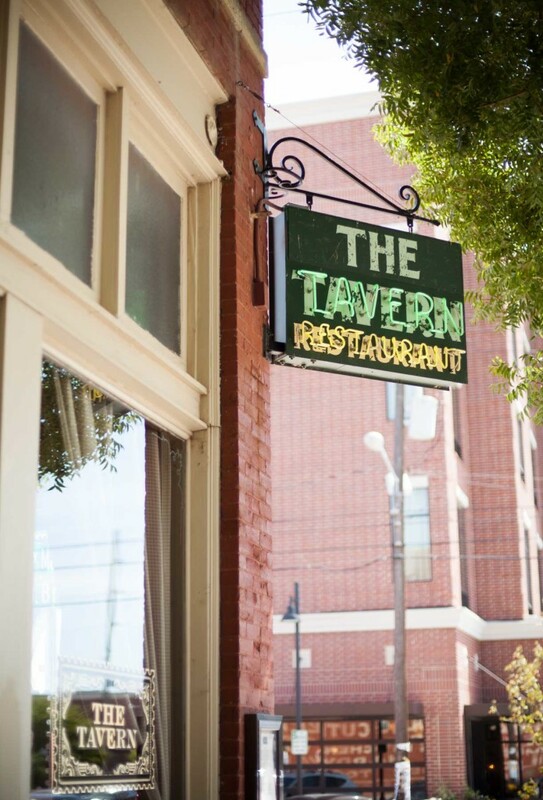 Dinner at The Tavern is versatile. It can be two dudes catching up over a beer and a burger. It can be a group grabbing a charcuterie and artisan cheese plate with some wine before the show. Or, it can be the event itself. 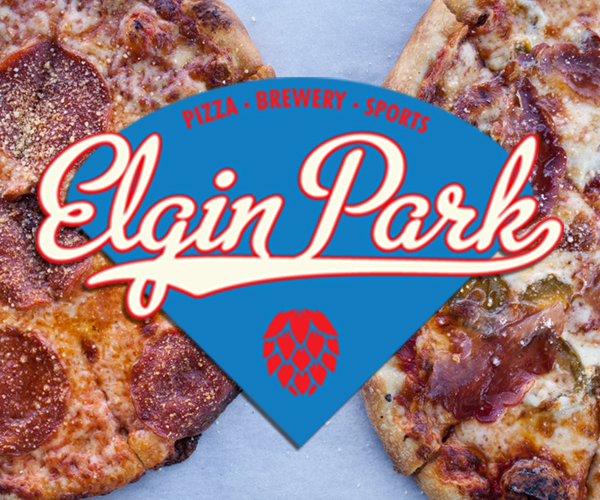 For this dinner experience we had to try the new Cedar Plank Wild Coho Salmon and the Veal Osso Buco for our main highlighted dinner courses and Tasting of Apples and Pumpkin Pie for dessert. The Cedar Plank Wild Coho Salmon ($30) with it’s simple and rustic presentation summons immediate thoughts and fall and harvest. The salmon was served medium with a delightful orange/golden crust that was presented with a stalk of fresh dill. 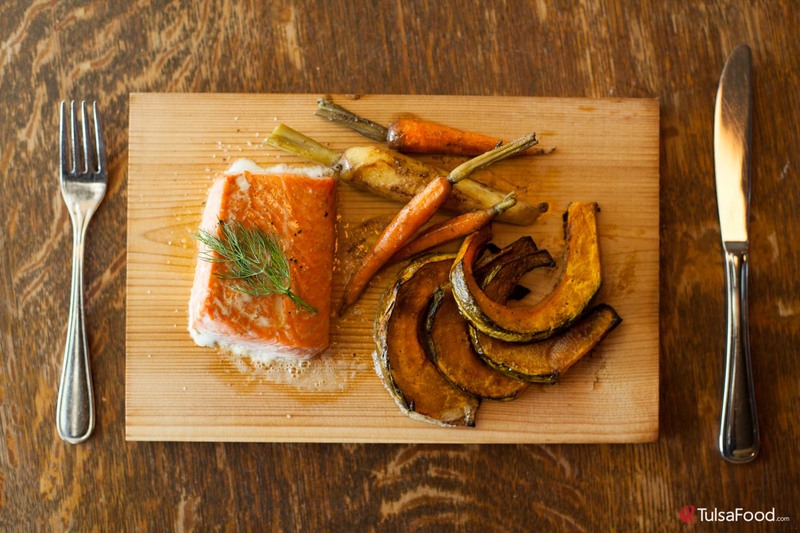 The fall vegetables served on the along side the salmon on the cedar plank were roasted baby carrots and kabocha. Kabocha is sometimes referred to as “Japanese pumpkin” which gives you a good sense of it’s texture and flavor. You may also think of it as some kind of exotic sweet potato the first time you try this dish. 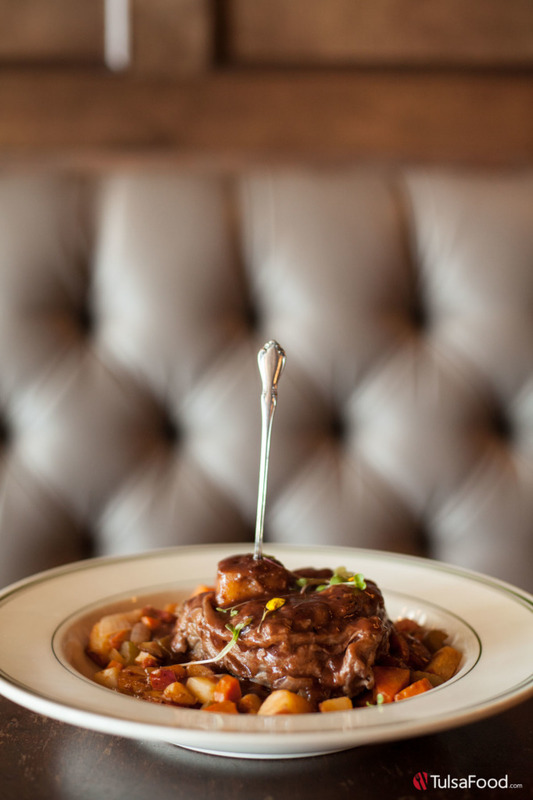 Our final dinner entree was the Veal Osso Buco ($38). Provided you like beef and heart warming stew, if this dish doesn’t get you in the mood for fall and Thanksgiving, then nothing will. The rich, super tender, bone-in veal is moderately coated in a red wine demi-glace and sites on thick bed of stewed red potatoes and potatoes and carrots. Order this with caution, because it may affect how you approach think about every “beef stew” you ever eat again in you life. Although it’s not a cheap version of this time honored fall and winter dish, it certainly may be the best version you’ve ever have. 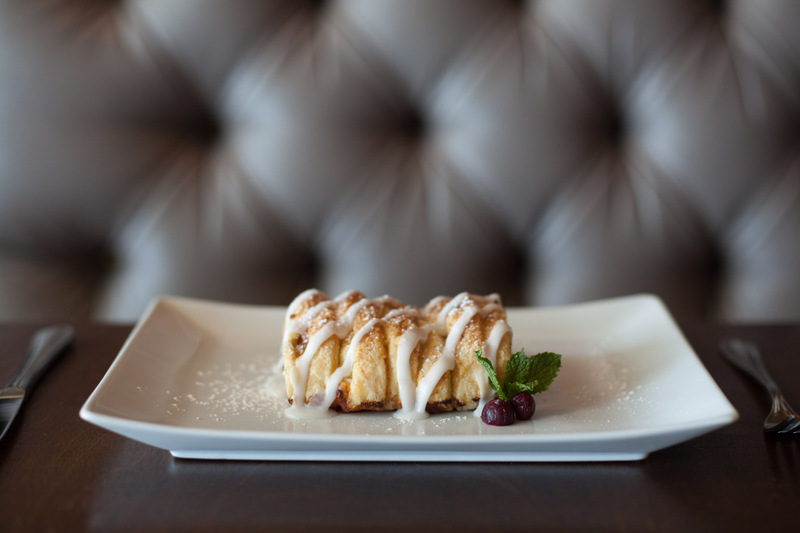 The Tasting of Apples ($7) is a tart/sweet combination of two apple strudel, cider mousse, and praline and is easily shareable after the filling entrees. 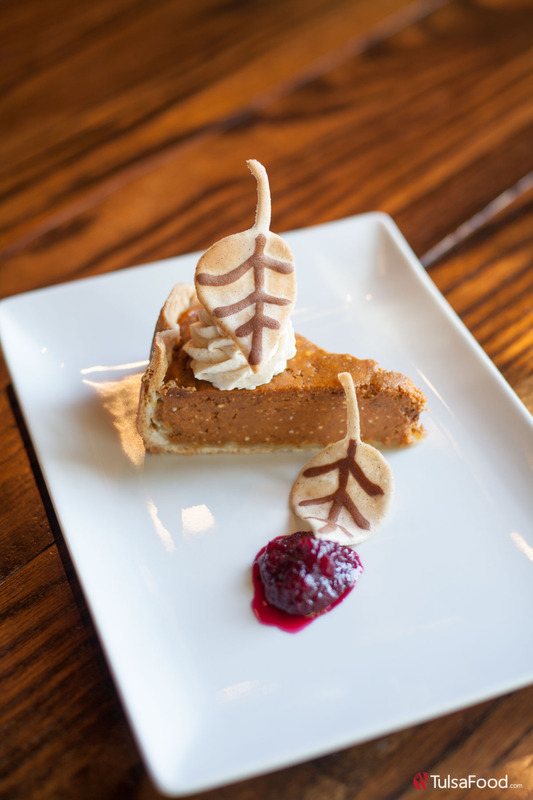 And to close out our meal we shared the pumpkin pie ($7) which was topped a Bailey’s whipped cream and a two thin leaf shaped ‘cookies’ beside a cranberry compote. This was the table favorite, and with one bite I knew it would pair perfectly with a Glenlivet 12yr, neat. Now, the conclusion to these three meals is this: Fall and Winter are here, and clearly The Tavern is ready to feed us accordingly. Enjoy! Friday – Saturday: 11:00 a.m. – 1:00 a.m.